Thanks to Australians’ fondness of new technology and willingness to spend money on it, Australia will be one of the few countries where Samsung will launch the Galaxy Note Edge. It will be joined by fellow phablet the Galaxy Note 4 and wearables the Gear VR and Gear S in the new Samsung product range. Last night Samsung Electronics Australia announced two new Galaxy Note phablets as well as two new wearables, a virtual reality headset and smartwatch will all be available in Australia before Christmas. Although big screens are the defining and determining feature of phablets, Samsung was keen to go beyond size and into the world of possibility opened up by this hardware. 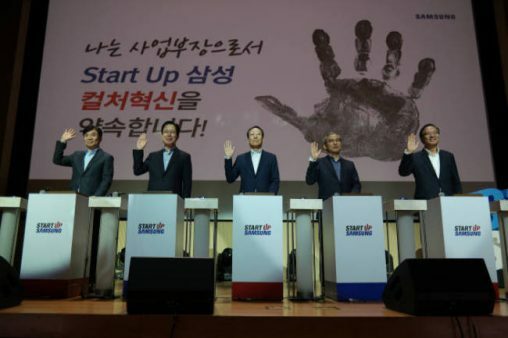 “Tonight is a pivotal moment for Samsung in Australia. 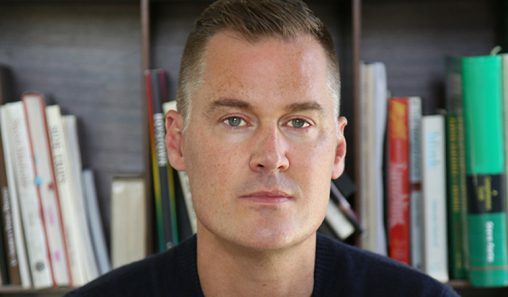 I think we are changing the mobile landscape and fundamentally challenging the status quo of what consumers can actually get from their technology,” said Arno Lenior chief marketing officer, Samsung Electronics Australia. The Galaxy Note 4 (RRP $ 949) has a 5.7-inch Quad HD (2560×1440) Super AMOLED display with better viewing angles than previous models within the Note range. The S-Pen stylus has also been made more pen-like for a “more authentic pen experience”. The camera system has been upgraded with the 16 megapixel rear-facing camera featuring Smart Optical Image stabilistation for clearer pictures in low light . The 3.7 megapixel front-facing camera offers 90 degree shooting angle and up to a 120 degree winde angle setting to squeeze more subjects into a selfie. Battery life has been given a boost with Fast Charging and Ultra Power Saving modes. The multi-window feature puts the big screen to good use, allowing users to view applications on the display with full, split or pop-up screens, and they can easily change the size and positioning of apps on the screen with one swipe. 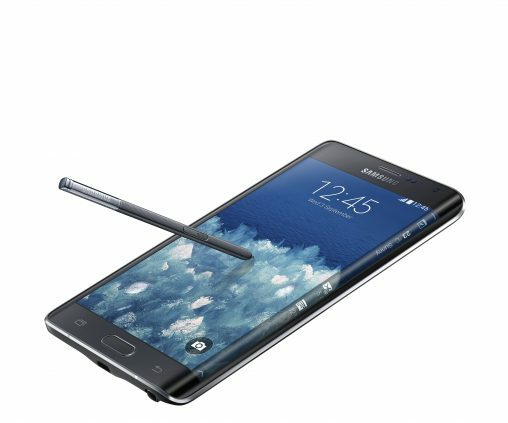 With many similar features to the Galaxy Note, a key feature of the seven-sided Note Edge (RRP $1,249) is a that notifications appear directly on the curved edge screen while video is playing so tasks are not interrupted. 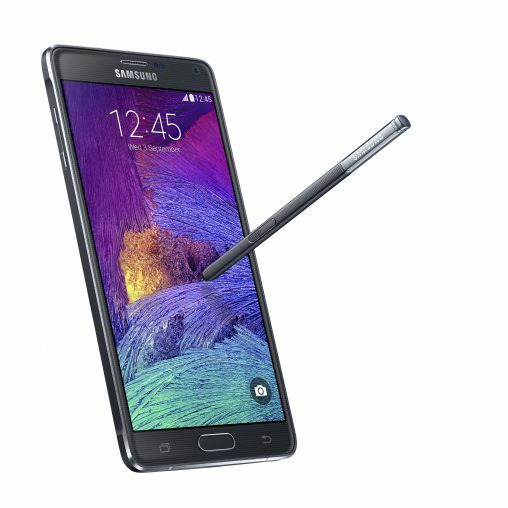 The Galaxy Note 4 will be available from the Samsung Experience Store and leading retailers from 29 October (pre-sale from 15 October) and the Galaxy Note Edge will be available from the Samsung Experience Store and leading retailers from 5 November 2014. 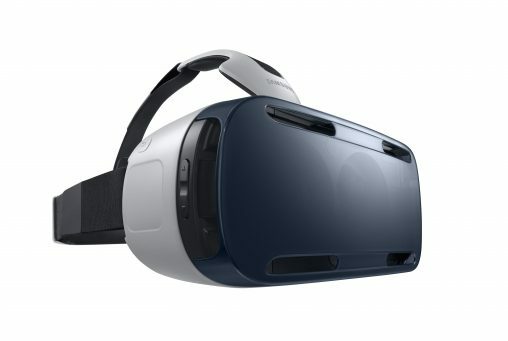 The Gear VR is a headset that gives the wearer a 360 degree view of a virtual reality when the Galaxy Note 4 is inserted inside it. It is the result of a partnership with Oculus, a Facebook company and a leader in virtual reality technology and every Gear VR will come with a 16 gig micro SD card which includes a range of immersive content. Content is currently limited but is being created by Oculus developers that will be available for download. “With the Note 4 and Gear VR, users can literally enter into a whole new and immersive virtual world seamlessly, having amazing experiences from any location. This is how we have redefined a smartphone,” Lenior said. Available in November with a RRP of $249, the Gear VR provides retailers with an opportunity to make an additional sale to customers already forking out RRP $949 for the Galaxy Note 4. But to make any sale retailers will first need to convince skeptics that looking a little silly is worth it to enter a virtual world. The advice from Samsung: “You need to put it on your face”. Trying out the Gear VR and physically experiencing it is the only to fully appreciate the device. Do not use Gear VR if you are under the age of 13 and please see a doctor before using Gear VR if you are pregnant, elderly, have pre-existing binocular vision abnormalities or psychiatric disorders, suffer from a heart condition or other serious medical condition or have had a seizure linked to an epileptic condition. Always be aware of your surroundings when using the Gear VR and remain seated at all times. Immediately discontinue use of Gear VR if you experience any visual abnormalities, dizziness, disorientation, nausea, any discomfort or pain, or any symptoms similar to motion sickness. 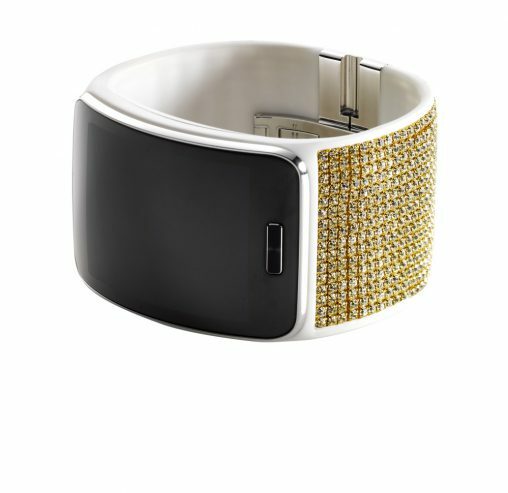 Also unveiled last night was Samsung’s newest smartwatch, the Gear S. It has 2-inch curved Super AMOLED screen and attaches to interchangeable bands including one designed by Swarovski (pictured below). 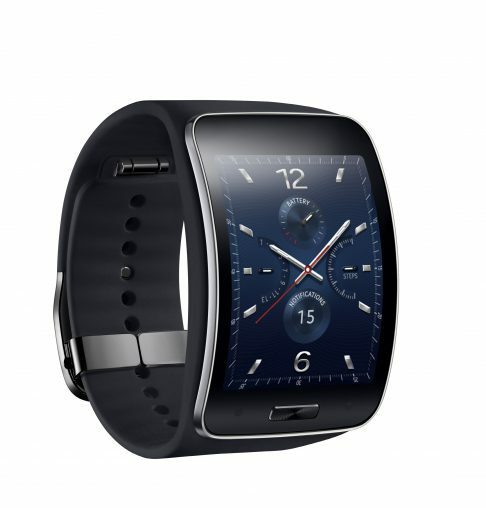 The Gear S will be available from the Samsung Experience Store and leading retailers in November with a RRP of $449. The Gear S connects via 3G, wi-fi or Bluetooth. A nano-SIM lets users make and receive calls using the device from almost any location within a telecommunications network. 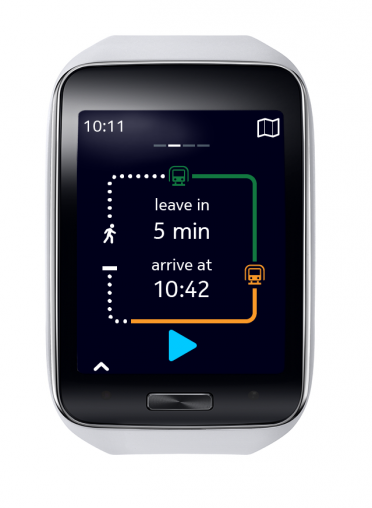 It also has an onscreen keyboard and an S voice function to issue tasks or take notes. “The Samsung Gear S redefines the idea of the smart wearable, bringing the latest in smartphone design and technology to a smartwatch,” Lenior said. Samsung has also developed a range of new Gear Manager wearable device applications for the Gear S to broaden its functions and appeal to different lifestyles. For example, Samsung’s S Health app uses the Gear S to track steps and measure a user’s heart rate+ while exercising. 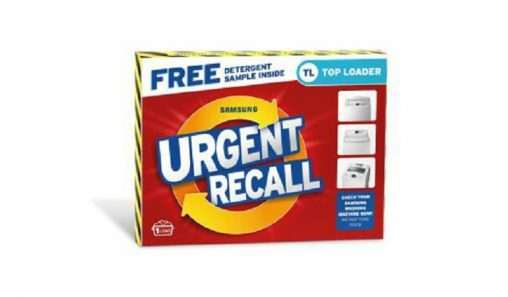 This data is sent back to the compatible smartphone for review and evaluation. Another addition to the Samsung wearable range is the Gear Circle earphones (RRP $179). When paired with a smartphone, users can easily receive calls, listen to music and issue voice commands through a Bluetooth connection straight through the earphones. 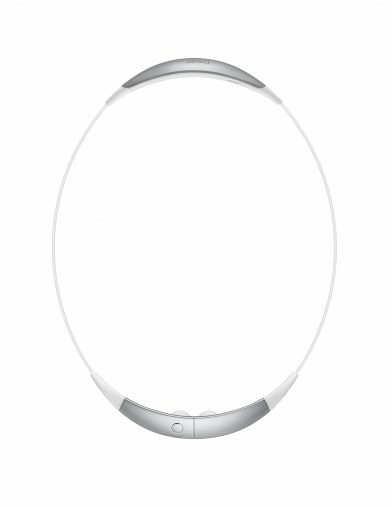 The Gear Circle features a magnetic lock which clasps around the user’s neck when not in use, as well as a vibrate function to signal incoming calls and notifications.